Imagine my added shock when, still intimidated by their sheer size and volume, I cracked one of these eggs open and two yolks spilled from it into the bowl. Something about this midnight experience sharply illuminated, to me, just what eggs really are (chicken fetuses), and how strange (disgusting) it is that we eat them. It’s freaky how big these eggs are. I’m officially freaked. Well, since you're in the mood for eggs, Jen, I have to tell you I got a microwave egg-poacher at Walmart recently and it's the best thing ever. I like poached eggs but didn't know how to make them, and this makes two in one minute, so our house has been routinely filled with the not-so-lovely smell of poached egg sandwiches of late. Nancy, I cannot, I will not blog about roosters you-know-whats. You cannot make me do it. (But you could do it and I would read it.) And thank you for the graphic lesson in a hen's ovarian cycle.Mom–it's real! 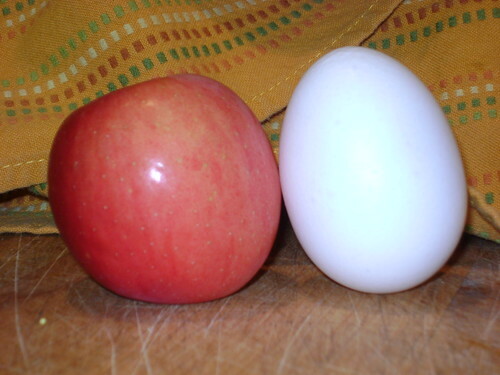 Very small apple, very large egg.Marsha–I hear you; Ethan was 9 lb, 7 oz. Not funGiana–I knew you meant "public" (pervo…:) And I want to watch that documentary but I'm scared. "Supersize Me" was bad enough. Heather–good call on not baking. My kitchen was a sty until midnight!The strange thing is that after all of this, I woke up this morning in the mood for eggs. What's wrong with me? oh, by the way, Jenn. Blog about this:The egg that drops is just like a woman's unfertilized egg. It's not a fetus unless it has been fertilized by the sperm. Yes, roosters have peckers. I've never seen a rooster on a hen, like we've all seen various other animals. Has anyone ever seen this going on?? The visual picture of rooster on hen makes me laugh!!! The whole idea of eggs being like human eggs makes me sick and is why I don't eat eggs but once a year. I even try to use egg replacer in cooking. oh my goodness – I am not sure if you should eat that!! Crazy! I would be stressing out wondering if my recipe called for two eggs, do i add one gargantuan egg, or still add two??? Too much to think about. That's why I don't bake! OK, girls, think of the poor hen! That's like birthing a 15 lb baby! On the other hand, I grew up on a farm; we had chickens, and double-yoked, large eggs do just happen. They don't normally get put in cartons to be sold!